Points and Places, and Lines and Concepts, a photo by timtak on Flickr. 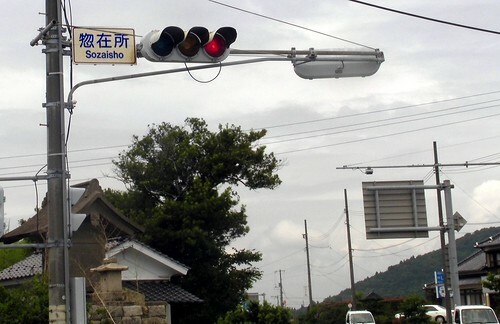 While the Japanese do not name their streets, other than the main routes with numbers, the Japanese do name the points on the map, the intersections, with signs that hang next to the traffic lights. Very few intersections are named in the UK (Hyde Park Corner, Clapham Junction being exceptions). If one wants to refer to an intersection one has to refer to it as the the intersection between two named streets. Westerners name the streets or lines on maps give the doors on the streets numbers, but do not name the points nor plots of Land. Japanese name the spaces and places but rarely name the lines on the map, giving only a few of the roads numbers. Points and places are given numbers, secondary to named lines in the West, lines are given numbers in Japan secondary to points and areas in space. 2) Japanese groups are organized according to spaces and those that are members of those spaces. 3) Shrines are the geo-locational model for the home and other spatial groups. 4) Lines are probably not felt to exist. 5) If there are signs on lines (streets/ boundaries between floors) then it is not to name the non-existent line or boundary but to refer to the surrounding spaces. Sometimes these signs are indexical (in the case of floor signs) and sometimes they are iconic (in the case of plot maps banchizu). Japan is no more "indexical" than it is iconic. The biggest difference is perhaps in whether the sign is thought to signify something visual (space, the place), or something conceptual. Western signs are thought to represent concepts. Japanese and Chinese signs are thought to represent things, and places that one can see (Hansen). In Western society, space is thought to be empty. It is not used as an organization tool or structuring function, but needs to be organized by named lines. Space exists, is cognizable in so far as it is bounded by lines, and given coordinates, or a street number. The lines are themselves named. The lines are the ideas represented by the names, rather than spatial entities.